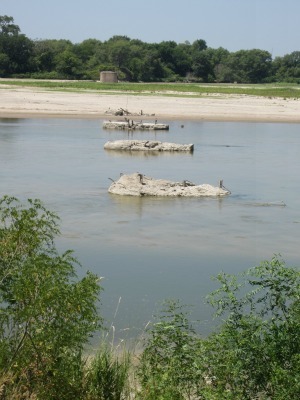 The Lower Platte River Corridor Alliance identified 12 sets of abandoned bridge pilings in the lower Platte River between Highway 75 near Plattsmouth and Highway 81 near Columbus. 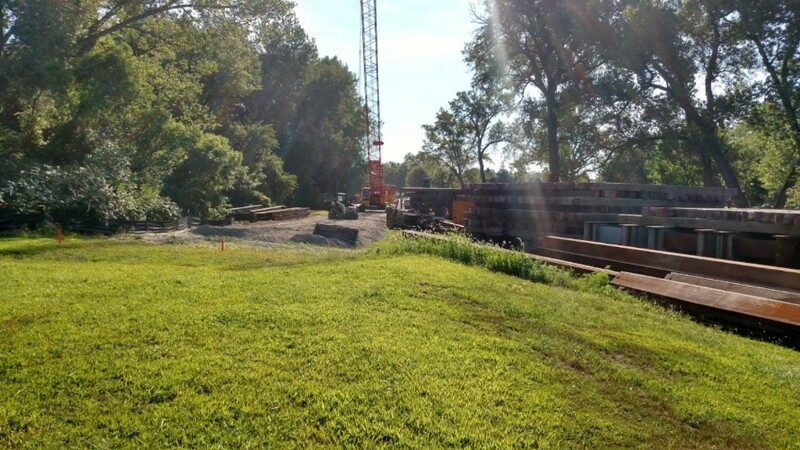 The LPRCA has removed three sets of the pilings that were left primarily from old railroad lines that were discontinued in the mid-twentieth century. 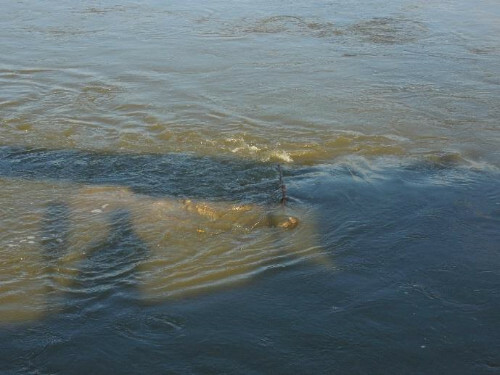 The pilings are not only hazards for boaters and recreationists, but also can exacerbate flooding by catching snags and ice. 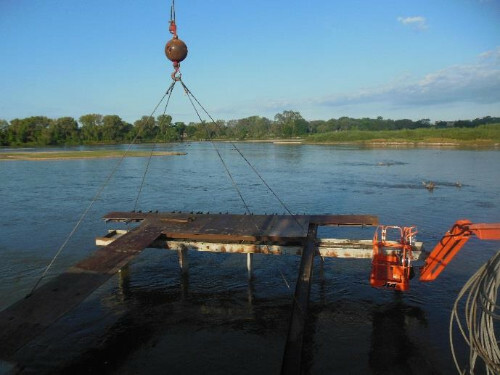 Additionally, removing the piers restores some of the natural ecosystem characteristics of the river. The previous removal efforts have been at Highway 50 in 2005 and two sets at Camp Ashland in 2007 and 2008. 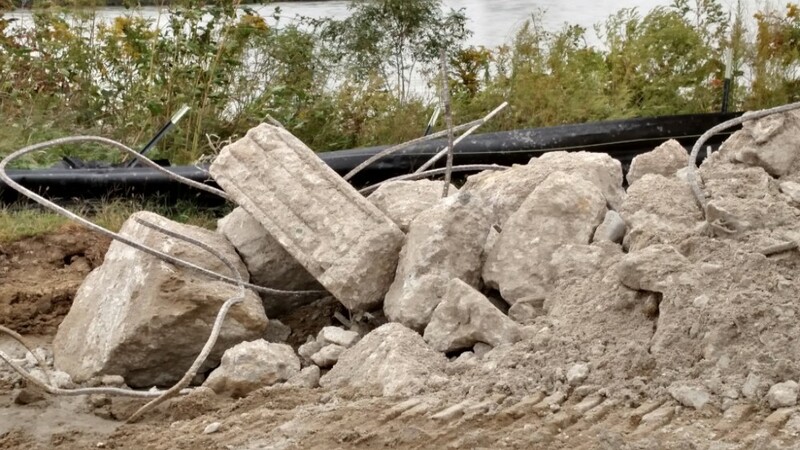 After 8 years of planning and raising funds, the Lower Platte River Corridor Alliance (LPRCA) completed the removal of five old railroad bridge piers from the Platte River at Two Rivers State Recreation Area. 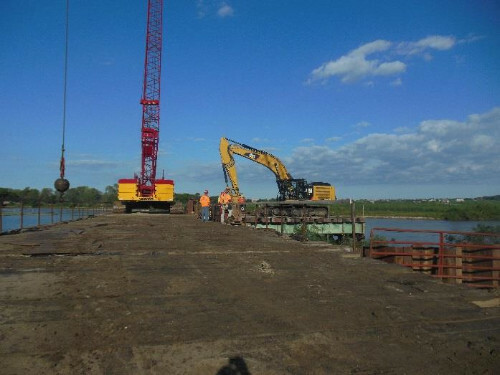 The contractor, Hawkins Construction, began work in-river in mid-August. 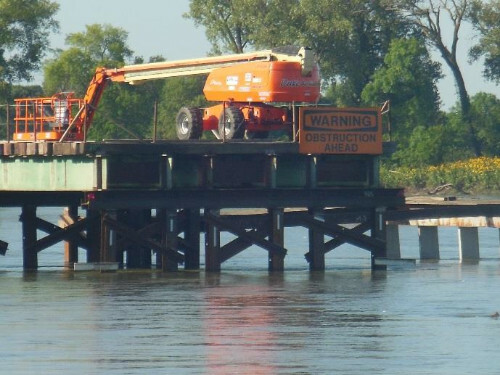 A temporary bridge was constructed to reach the piers. 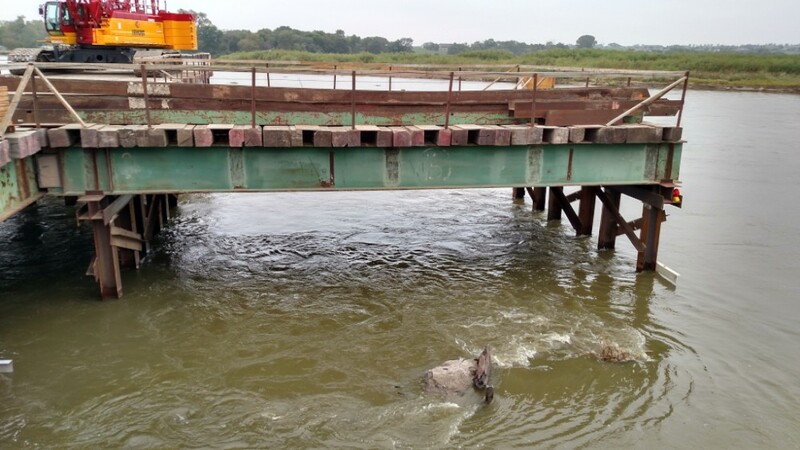 The demolition process was completed well ahead of schedule with the fifth and final pier being removed on October 22nd and the temporary bridge being fully removed from the Platte River during the second week of November. The construction caused a temporary closure of Riverside Campground at Two Rivers SRA but the campground will resume normal operations. Final seeding of the disturbed area at the campground will occur in spring. The project was made possible through funding from the three Natural Resources Districts, a grant from the Nebraska Environmental Trust and a grant from the Recreational Trails Program, administered by the Nebraska Game and Parks Commission. September 10, 2015 – Photo showing bent guide in place in preparation of driving bent row 6. 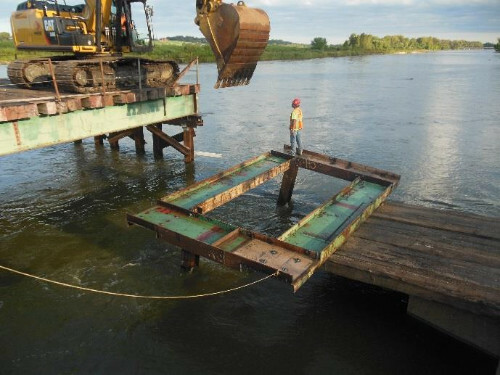 September 10, 2015 – Photo showing finger #1 and the framework to guide in the sheet pile for coffer dam #1. September 10, 2015 – Photo showing finger #2 and warning sign placed on the upstream face of the finger. 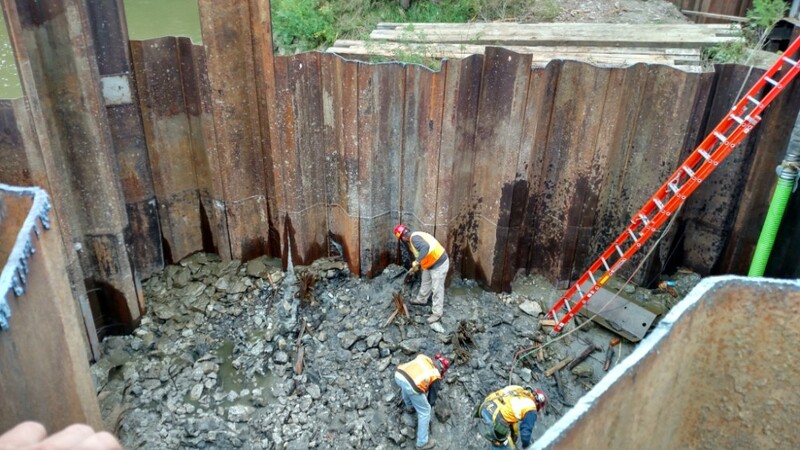 September 10, 2015 – Photo from abutment showing fingers #1, #2, and equipment. September 10, 2015 – Photo showing Pier #3.